the Ku-ring-gai Chase National Park"
The Bobbin Inn Café is open 6 days a week for Breakfast and Lunch or later for bookings. We have a large range of hot and cold food and drinks, including snacks, full meals, all day breakfast, kids meals and a large selection of cakes and desserts. See our menu for the full range. Relax indoors or in our sunny outdoor dining area and soak up the ambience of the national park and let our friendly staff serve you. During the winter months the woodfire in our dining room will be lit to keep you warm and cosy. On weekends and holidays we have Paddle boats for hire and Ferry cruises that explore the Cowan waters of Broken Bay. The surrounding parklands are flat and disabled friendly with shelters and facilities, mangrove boardwalks, bushwalking trails and a kids' playground. See things to do to plan your day in the area. 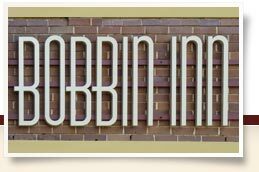 The Bobbin Inn Café is an historic 1930's restaurant now lovingly restored as a Café and also home to the National Park's information centre that has local info, maps and souvenirs. Take an adventure into the wilderness on Sydney's northern fringe and enjoy a snack or meal with us.